HÀ NỘI — Hail, thunderstorms and strong winds that hit several northern mountainous provinces over the past three days have caused damage to agricultural production, according to the National Steering Committee for Natural Calamity Prevention. More than 1,200 roofs in Định Hóa, Phú Lương and Đại Từ districts of Thái Nguyên Province were blown away or damaged due to the storms which swept through the locality on Sunday night and early Monday morning. Hundreds of hectares of farm produce were destroyed. The total damage to property and farm produce in Thái Nguyên province was estimated to reach more than VNĐ31 billion (US$1.3 million). More than 170 roofs were blown away in areas along the Kỳ Cùng River and in Tràng Định District of Lạng Sơn Province on Monday and Tuesday. In Tân Tiến and Hùng Việt communes of Tràng Định District, nine houses were severely damaged. No human casualties were reported. 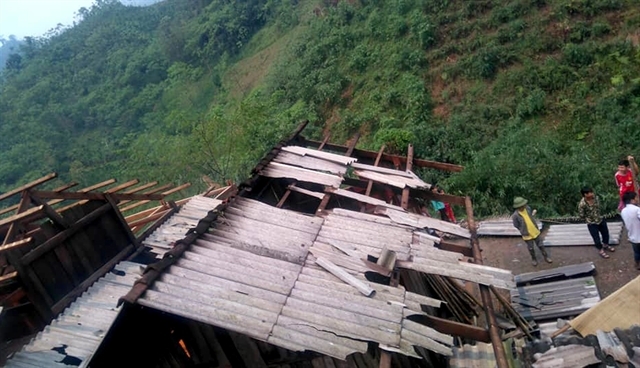 In Tuyên Quang Province, thunderstorms and winds destroyed three houses. Hail lasting for five minutes on Monday in Lào Cai Province caused damage to farm produce in the affected area.